In a dusty corner of the Andalucian desert, near the town of Nijar in the province of Almeria, sits a small 19th century stone church. For locals it is shrouded in tragedy and renowned as the setting for a shocking true crime on which Federico García Lorca is thought to have loosely based his pastoral drama Blood Wedding. In July 1928, a reportedly plain young woman (with a large dowry) called Francisca Cañada Morales was due to be married in the stone church to dull but dependable local labourer called Casimiro Perez Pino. Francisca was not keen on the marriage, but was rather in love with her dashing cousin Curro Montes Cañada. After an argument with her fiancée the night before the wedding, Francisca abandoned the wedding plan and eloped with her cousin. Fate was against the young lovers, and they ran into Casimiro's brother Jose in the church on their escape. Quickly realising what was happening, he shot Curro Montes dead in a bid to save his family's honour. The crime was first reported in the newspaper Heraldo de Madrid in 1928. It is generally believed García Lorca would have read articles about the crime and used it as inspiration for the tragic love story he wrote in 1932, although he increased the appeal of the main figures in the story for dramatic impact and incorporated a mythological element. Film buffs might recognise the church in which the murder took place as the setting for scenes in the Clint Eastwood film The Good, The Bad and the Ugly. 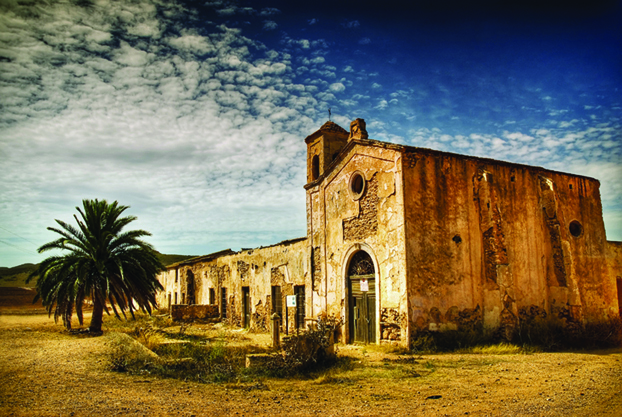 The church has since fallen into disrepair but is still a destination of interest to fans of García Lorca's work.